Knee pain of any kind can make it difficult to enjoy your favorite activities or even walk comfortably. When a patient suffers from chronic knee pain, stiffness, and swelling that causes them to limp or limits their ability to perform certain movements, it can be a sign of a more serious injury that requires a precise diagnosis and treatment. Board-certified orthopedic surgeon Steven W. Meier, MD is an expert in knee injuries and can provide you with an accurate diagnosis and treatment to relieve your pain. Utilizing regenerative medicine and the latest cutting-edge techniques that are proven to eliminate knee pain and repair damage with the best non-invasive methods, Dr. Meier can help you return to your day-to-day activities as soon as possible. 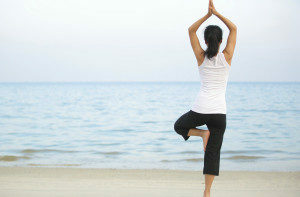 Chronic conditions: Arthritis, osteoarthritis, etc. After an initial evaluation of your pain and range of motion, Dr. Meier may use one or more tests like x-rays or MRI images to pinpoint the cause of your knee pain. Regenerative medicine is a variety of cutting-edge techniques that jumpstart and support the body’s own natural healing processes, not only improving the recovery of damaged and diseased tissues but also decreasing pain and edema. These techniques can be used to reduce the recovery period following surgery or as a minimally-invasive alternative to surgery altogether. Hyaluronic Acid/Viscosupplementation: Viscosupplementation is a procedure in which lubricating fluid is injected into a joint. Also called hyaluronic acid injections or hyaluronan injections, this treatment can help patients recover from chronic knee pain caused by injury or chronic conditions like osteoarthritis. Hyaluronan is a naturally-occurring substance found in many tissues throughout the human body and is the key component of synovial fluid, the nutrient-rich, viscous liquid that provides lubrication to the joints and acts as a shock absorber. With a series of injections administered directly into the joint, hyaluronic acid injection therapy helps decrease inflammation and restore joint fluid. This joint-preserving technique also serves as a nutrient supplement to help improve joint health. Prolotherapy: Proliferative therapy, or prolotherapy, is an injectable procedure in which a dextrose-saline solution is used to stimulate the production of collagen and other building blocks of cartilage in damaged joints. Prolotherapy helps cushion the joints and reduce painful inflammation while also aiding the body’s natural healing process. Dr. Meier employs a unique “hybrid” technique also incorporating perineural injection therapy (PIT) which used very tiny needles to inject dextrose around sensory nerves to reduce neurogenic inflammation. PRP Therapy: Platelet-rich plasma (PRP) therapy is an injectable treatment that utilizes a concentrate of your platelets and other growth factors derived from a blood sample to stimulate the natural healing process in damaged or diseased tissues. Once injected into the damaged joint or tissue, PRP helps improve recovery times. Stem Cell Therapy: Stem cell therapy utilizes a patient’s own stem cells to facilitate the replacement or regeneration of damaged or diseased cells with healthy, functional cells. Stem cells are an important component in recovery because they are conductors of repair and regeneration for the tissues of the body. When the body sustains an injury, adult mesenchymal stem cells (MSCs), also known as “medicinal signaling cells,” will naturally go to the area of trauma to stimulate other cells to begin the tissue repair process. Also, MSC’s reduce painful swelling by down-regulating the inflammation cycle. At Meier Orthopedic Sports and Regenerative Medicine adult stem cells are harvested from the patient’s own bone marrow (bone marrow aspirate concentrate or “BMAC”) or fat (adipose) tissue to be concentrated and then injected into the injured area. Arthroscopic surgery is a minimally-invasive outpatient procedure that requires only a few small incisions in order to treat a multitude of knee injuries and conditions. The benefit of an arthroscopic procedure is that they are performed by making small access “portals” in the skin and using a fiber optic viewing lens and specialized instruments to perform simple or extensive work on the inside of the joint without the need to make large incisions or cut into any muscle. Arthroscopic techniques offer patients who suffer from knee injuries, like meniscus tears or anterior cruciate ligament (ACL) reconstruction, with a less-invasive option that requires less recovery time and reduced complications and pain compared to more traditional surgical treatments. The meniscus is a C-shaped piece of cartilage in the knee that cushions the thigh bone and shin bone, safely distributing body weight and reducing friction during everyday movement. When the meniscus is damaged, a physical examination and MRI imaging can be used to evaluate the severity of the injury. For some cases, rest and physical therapy can effectively aid in the resolution of symptoms after meniscus tears. Injection therapy such as prolotherapy, PRP and stem cell therapy can often be used to reduce or resolve painful symptoms by down-regulating inflammation caused by the tear. If non-surgical measures do not effectively resolve the symptoms, then arthroscopic surgery can play an important role in treatment. While some meniscus tears can be repaired, there are cases that require the inner, torn part of the meniscus to be removed. The surgeon uses small scissors and a shaver placed through small arthroscopic portals to perform what is called a partial meniscectomy. Steven W. Meier, MD is a board-certified orthopedic surgeon and world-renowned expert in the treatment of meniscus tears and joint preservation. Dr. Meier has a special interest in the evolving field of cartilage restoration. Cartilage or chondral defects are second only to meniscus tears as a culprit of mechanical knee pain. Cartilage injuries are particularly problematic since cartilage has no inherent reparative ability. New technology in cartilage restoration is changing that. While Dr. Meier has extensive experience with the established techniques of microfracture chondroplasty, osteochondral graft transfer, autologous chondrocyte implantation (ACI) and its next-generation matrix-induced autologous chondrocyte implantation (MACI), his current interests involve in the use of stem cells to facilitate cartilage regeneration. If you have a symptomatic chondral lesion in your knee in the absence of significant arthritis, you may be a candidate for cartilage restoration. The anterior cruciate ligament (ACL) is one of four major ligaments in the knee that help stabilize the joint. When the ACL is damaged, the knee becomes destabilized and may buckle or “give out.” The ACL can be reconstructed using graft tissue by way of an arthroscopically-assisted procedure. Other damage in the knee, such as cartilage and meniscus tears, is also commonly addressed at the same time. Using just two or three small incisions or “portals” and a fiber optic viewing lens to visualize the interior of the joint, Dr. Meier is able to reconstruct the damaged ligament. Recently, there has been increasing interest in the direct repair the damaged ACL versus the standard procedure of cutting out the damaged ligament and replacing it with graft tissue. The advantages to retaining and repairing the native ACL may include preservation of the natural nerve and blood vessel supply. This could lead to better healing, a more natural restoration of knee biomechanics and improved proprioception or “position sense” during athletic activity. There is also much recent interest in using regenerative therapies such as platelet-rich plasma (PRP) and stem cell therapy to stimulate ACL healing. Dr. Meier is currently utilizing these novel modalities in the appropriate candidates and reviewing the results to determine if superior results can be obtained or comparable results to reconstruction but with less invasive intervention. medlineplus.gov explains more about ACL surgery. The medial patellofemoral ligament found on the inside part of the kneecap is part of the complex network of soft tissues that stabilize the knee. When a patient dislocates their patella due to trauma from athletics or an accident, this ligament can be injured, leading to recurrent patellar instability. Alternatively, other patients can experience instability and dislocations of their patella in the absence of a traumatic injury due to congenital factors involving bony anatomy or generalized soft tissue laxity. MPFL reconstruction is an advanced surgical procedure in which a new medial patellofemoral ligament is created to stabilize the knee and help protect the joint from additional damage. This treatment offers an excellent treatment option for people who have experienced more than one dislocation or extensive damage and instability to the cartilage in the knee. A leading cause of chronic knee pain is arthritis. This includes osteoarthritis, rheumatoid arthritis, and post-traumatic arthritis, which can lead to cartilage damage, chronic pain and inflammation due to cartilage roughening and erosion. For these patients, a total knee replacement or arthroplasty is the best procedure to provide relief for these symptoms and improve function. Most arthritis suffers can find relief with non-surgical treatment including injection therapy such as hyaluronic acid/viscosupplementation, platelet-rich plasma, and stem cell therapies. Dr. avoids the use of corticosteroid (“cortisone”) as it tends to be short-acting, can have adverse systemic effects and has been shown to accelerate cartilage degeneration in the long term. Dr. Meier’s approach is always to explore non-surgical options for painful arthritis before resorting to invasive surgery. For patients who may not respond adequately to injection therapy, total knee replacement surgery can be an option. A total knee arthroplasty involves surgically removing the damaged cartilage as well as a thin amount of bone from the femur and tibia. The cartilage and bone are replaced with metal implants that are cemented or “press fit” into the femur and tibia. A plastic spacer is also inserted between the metal prosthesis to ensure smooth movement of the joint. 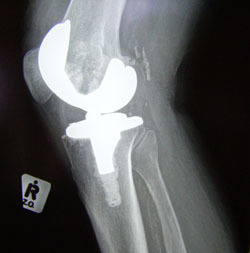 The patella (kneecap) may also be resurfaced with plastic, in some cases. For our patients who need a total knee replacement, Dr. Meier is one of the few orthopedic surgeons who is certified to use the Mako robotic-arm-assisted technology to perform total knee replacement surgery. This innovative technology provides unparalleled precision for positioning and accuracy when placing the implant. Not only will should this increase the longevity of the implant, but it may also reduce the need for a future revision surgery. Unicompartmental arthroplasty or “partial” knee replacement can be used when arthritis is confined only to one compartment of the knee rather than occurring throughout the joint. Partial knee replacement involves replacing only the damaged part of the knee joint rather than the entire knee. Approximately 10-20% of candidates for knee replacement surgery qualify for this less extensive procedure. By replacing only the affected parts of the joint, the healthy tissues and structures of the knee remain intact, resulting in faster recovery times and better preservation of joint function. The procedure can often be performed on an outpatient basis. Dr. Meier is one of the world’s foremost experts in knee pain treatments and joint preservation. He has extensive training and experience in treating various knee injuries and conditions using the latest non-invasive and minimally invasive techniques. Find out more by contacting his Beverly Hills orthopedic practice today. You may also fill out our contact form and a representative from Meier Orthopedic Sports and Regenerative Medicine will be in touch with you shortly.